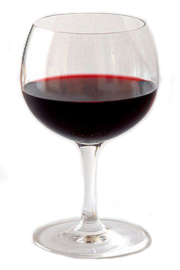 I'm not a native French speaker but have always ordered "une tasse de [vin] rouge" ('vin' optional) at the bar. My partner (and her living-in-France-but-not-native-speaker parents) say I should be ordering "une verre de [vin] rouge". Does "une tasse de [vin] rouge" make any sense at all? If so, what is the difference "tasse" vs. "verre"? Using "verre" sounds far more formal and more like a reference to the glass itself to me. Is it a regional thing? This not about formalism. 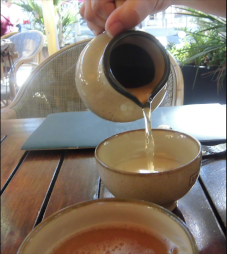 Both tasse and verre can be used with the same language levels. They just happen to be significantly different containers. A tasse de vin doesn't make sense1. Nobody drinks wine in tasses at a bar. Some verres have a handle and are called chopes, sometimes used to drink beer. and spherical ones are called ballons. un ballon de rouge (informal). 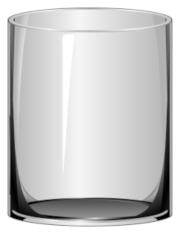 1 Note that in wineries (caves) and among wine professionals, a small metallic cup (often in silver) with a handle was traditionally used to look at and taste wine and called a tasse à vin or tastevin. Here taste is the same word as the English verb to taste (modern French tâter). The similarity with tasse is a pure coincidence. Generally, the wine tasted by professionals (and reasonable amateurs) is spit and not drunk, and the trend is to use glasses instead of tasses à vin. In any case, it is not expected for a tasse à vin to be available at a bar. Credits to @aCOSwt for pointing this rare tasse à vin. 2 I guess your mistake is due to the fact the English "cup" might translate to tasse (cup of tea - tasse de thé), coupe (World Cup - Coupe du monde, Cup of champagne - Coupe de champagne), and verre / gobelet like tumblers in a fast-food. "Cup-holders" in cars or planes are called porte-gobelets. 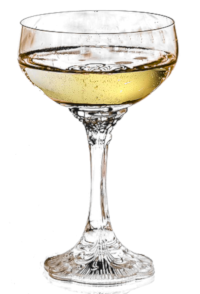 People still often say coupe de champagne even while using flutes but anyway, coupes are not used to drink red wine so none of tasse, coupe or gobelet would have work at a bar. Not the answer you're looking for? Browse other questions tagged expressions-idiomatiques régionalismes or ask your own question.